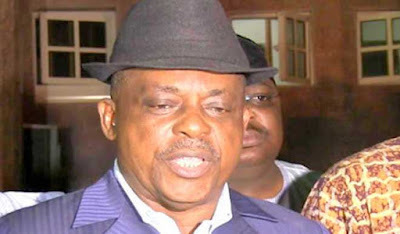 A former acting chairman of the Peoples Democratic Party, PDP, Uche Secondus, has been elected the new chairman of the party. Mr. Secondus beat three other contestants to emerge victorious in a keenly contested election held at the Eagles Square Abuja on Saturday. The chairman of the electoral committee of the convention, and former Governor of Benue State, Gabriel Suswam, who announced the results, said Mr. Secondus scored a total of 2,000 votes out of the total number of 2,296 votes cast. Mr. Secondus was followed by a former Minister of Education, Tunde Adeniran, who scored a total vote of 231 votes, while the duo of Raymond Dokpesi and Taoheed Adedoja scored 66 and 0 votes respectively. The Rivers State politician was declared winner shortly after two out of the chairmanship candidates accused officials in charge of the convention of allowing systematic rigging of the election. Raymond Dokpesi and Tunde Adeniran said the processes were skewed against them, but in favour of Mr. Secondus. Mr. Dokpesi told journalists covering the convention that he complained about the circulation of a document referred to as “Unity List” to delegates asking them to vote for the people on the list. He said the chairman of the electoral sub-committee of the convention, former Governor Suswam, told him that there was nothing he could do about his complaint. On his part, Mr. Adeniran, through his spokesperson who spoke with members of the press at Eagles Square, venue of the convention, called for the cancellation of the entire exercise because it was compromised. The convention committee had earlier announced the ban on all form of campaign at the venue of the convention.